A rare Robert Taylor edition signed by the highest and the third highest scoring Aces of all time, plus 7 other Knight’s Cross holders who flew on the Eastern Front. Between them amassing an extraordinary 1452 victories. In the final painting of his much sought after Hartmann Trilogy, Robert Taylor has portrayed the world's greatest fighter Ace achieving the first of his 352 air victories. Erich Hartmann's first success in combat was also very nearly his last! On November 5, 1942, flying wingman in a Schwarm of four Me109s of JG-52, his flight had scrambled to intercept Russian Lagg-3s and IL-2 fighter-bombers bound for the Front. Splitting into two elements they dived steeply into attack, screaming in behind and below the enemy aircraft a few hundred feet off the deck. Selecting one of the IL-2s, the rookie pilot closed at high speed, commencing firing with 20mm cannon from about two hundred feet. His first pass was unsuccessful but, undeterred, Hartmann zoomed up and dived over for a second run at the Russian machine. Holding his fire till the IL-2 filled his gun-sight, he drilled cannon shells into the oil-cooling system setting the enemy aircraft on fire. 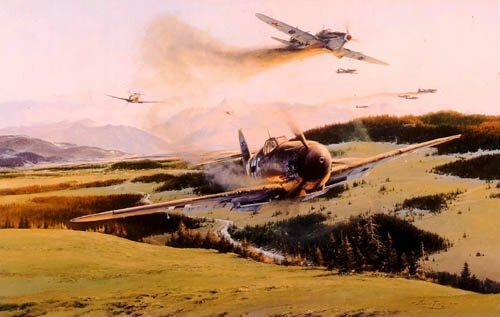 Closing rapidly from behind, Hartmann's Me109 was showered with debris from the doomed Russian plane, causing an explosion in the young pilot's own aircraft, which immediately caught fire. Now at very low altitude, Hartmann had no alternative but to belly in. With great presence of mind he cut power, fuel and ignition switches as he crash-landed at high speed in a massive cloud of dirt and dust. Though he lost his aircraft, Hartmann had made his first kill, the IL-2 crashing with a resounding explosion a few miles distant. Unhurt, the young future Ace was picked up and returned to base almost immediately by a German car. And thus a legend was born: It was the first of 352 air victories, which would make Hartmann the top scoring fighter pilot in history. 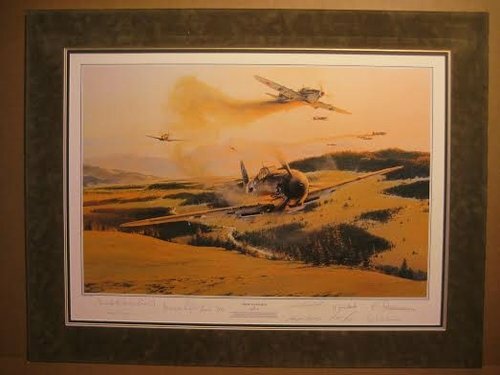 In the final print in his best-selling Hartmann Trilogy, Robert Taylor's dramatic painting, Birth of a Legend, set in the picturesque Caucasus mountain region bathed in the golden hues of autumn, captures for posterity the dramatic moments that launched the career of a fighter pilot legend.